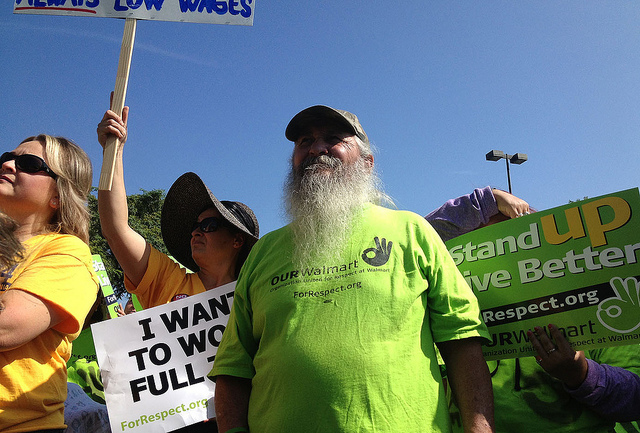 The nation’s largest retailer — Walmart — is in the throes of a bold movement for worker justice. The company has faced a number of separate strikes in less than a month and, rather than its typical retaliatory response of firing workers, Walmart is backing down and conceding to some demands. Workers raised the stakes last week when more than 200 striking workers showed up at Walmart’s global headquarters in Bentonville, Arkansas, as executives met for its annual financial analyst meeting on October 10. The retail associates — from 28 Walmart stores in 12 states, according to Democracy Now! — walked off their jobs the day before as labor organizers began running ads in Arkansas newspapers supporting Walmart workers. A Walmart memo leaked to Huffington Post over the weekend confirms the seriousness with which the company is viewing the strikes, revealing how powerful organized labor can be when it taps into strong community support, utilizes social networks, and engages in direct action. Also joining Walmart’s striking retail workers in this historic struggle were Walmart’s warehouse workers from Illinois and California whose successful strike for better conditions and wages started a nationwide wave, putting visible pressure for change on how Walmart treats its workers. Warehouse workers from Illinois and California met with Walmart executives on October 17 in Bentonville, another first for a company whose “open door” policy has meant refusing to meet with groups, instead favoring individual meetings. Retail workers are still demanding for a group meeting with Walmart to discuss their own treatment and will not relent until they get one. Last month, workers in Elwood, Illinois, walked off their jobs in the Joliet-area distribution center to protest unsafe working conditions and wage theft. The workers, who are organized — but not unionized — with Warehouse Workers for Justice (WWJ), picketed their employer, Walmart contractor RoadLink, with a list of complaints and demands. The Elwood strike began on September 15 when workers — including some who are part of a WWJ organizing committee — delivered a petition to RoadLink management that had been circulating among the workers. The WWJ organizing committee trains workers to be leaders in their workplace through know-your-rights workshops and skills trainings to organize and defend those rights. Some of the concerns listed in the petition included complaints about workers not knowing when their shifts would end, discrimination and unsafe working conditions. Four workers were immediately fired once the petition was delivered. Right there and then, an impromptu decision was made to walk off the job, and the strike began. Two weeks later, Walmart shut down its largest distribution center in North American in anticipation of protest. On October 1, the striking workers — there were about 40 walking a daily picket — were joined by hundreds of supports, including clergy members, community organizers and other activists in solidarity with WWJ. Over 650 people showed up — with 11 buses coming from Joliet and Chicago — at the nation’s largest inland port. Cadres of county sheriffs, state troopers and riot police met the activists in full force, and 17 people were arrested for blocking a road in an act of civil disobedience. Then, on October 5, strikers delivered a petition to Walmart management in Chicago with more than 100,000 signatures in support of the workers’ demands that conditions improve and retaliations end against outspoken workers in the company’s distribution centers. The following day, after being on strike for three weeks, the Elwood warehouse workers returned to work with full back pay and promises from Walmart to establish protocols for its warehouses. The Illinois victory came on the heels of similar actions taken by warehouse workers at a California Walmart distribution center. In Ontario, California, workers supported by Warehouse Workers United (WWU) went on strike in mid-September to protest unsafe working conditions — broken equipment, dangerously high temperatures, no ventilation and inadequate access to clean drinking water. As some workers started to levy complaints with management, the bosses retaliated by demoting and suspending outspoken workers. Walmart’s warehouse workers are temporary workers — subcontracted with a temp staffing agency that is subcontracted with a logistics company that, ultimately, is contracted with Walmart. Dave Jamieson published an investigative report for Huffington Post last year that detailed the ways Walmart outsources its labor to cut costs — a business practice that typically leads to a dangerous and illegal work environment and poverty-level wages for workers. During the strike, workers and organizers embarked on the “Walmarch,” a six-day, 50-mile march from the Inland Empire to Los Angeles to raise awareness about warehouse conditions. The Walmarch and its accompanying public awareness campaign recalls farmworker pilgrimages that Cesar Chavez and the United Farm Workers made during their struggle for better wages and work conditions for grape growers in the 1960s. “We march[ed] so that the world sees us and so that we can improve our jobs,” said Marta Medina, a warehouse worker who made the trek. The mass action was both exciting and encouraging. Over 120,000 expressed support for the California workers in an online petition. It was overwhelming for the workers, said Brennan, for them to know that the public is joining the efforts to improve warehouse jobs. When the California warehouse workers returned to work on October 5 with the promise that their work environment will change, it represented a significant victory for a labor movement that is increasingly dependent on community support. The widespread public support that the warehouse workers received exemplifies how strikes can be successful in achieving multiple goals. The strikes shone a light on some of the more vulnerable, invisible yet essential workers in America’s retail supply chain. In the short term, warehouse workers won their principal demands, while the public exposure and media coverage also strengthens long-term efforts for changing the standards in the warehouse industry. Now, California legislators are poised to pass new laws that would protect the state’s warehouse workers. But these successful strikes do much more than force Walmart to change its supply chain policies. The strikes demonstrated to others the efficacy of using direct action tactics in a campaign. Walmart’s retail workers, or associates, have long petitioned their employer for better working conditions, treatment and wages. Long, drawn-out legal challenges have embittered labor activists and employees, as the Walmart Litigation Project has extensively documented. But for the first time, workers on the retail end of Walmart’s corporate dominion went on strike themselves. Walmart associates who are organized with OUR Walmart — a United Food and Commercial Workers (UFCW) affiliated organization — went on a one-day strike on October 4. The historic strike — a first in Walmart’s 50-year corporate history — was intended to take advantage of the positive exposure Walmart workers had been receiving as well as to strengthen organizing efforts for associates’ demands for better wages, benefits, full-time jobs and an end to the retaliation against outspoken workers. UFCW also anchors Making Change at Walmart, an organization for community support for Walmart’s retail workers that, Evan Yeats, campaign communications coordinator at UFCW, called absolutely “integral” for strengthening the striking workers’ cause. But that publicity stunt quickly evolved into the nationwide strike. Using traditional face-to-face organizing within Walmart stores and utilizing social media and Internet technologies, OUR Walmart members connected with each other and mobilized for the walkout on October 9. Mary Pat Tifft is a leader with OUR Walmart from Kenosha, Wisconsin, who connects with Walmart associates across the country using social media. She has enabled workers to hear each others’ stories and see that they are not alone. “Social networking is the grandest tool of all for us. I don’t believe we would be here without it,” said Tifft about the associates’ strike when we spoke by phone about how the strike spread from Southern California across the nation in less than a week. All of the workers have returned back to work, but they still seek a meeting with Walmart as a group. When Warehouse Workers for Justice organizer Leah Freid hailed the courage of the Elwood workers for choosing to strike, she was recognizing the challenges labor organizers and workers face in a society with shrinking union density. The strikes — in both Illinois and California — are just the latest developments in the long-term struggle for Walmart’s workers. Class action and individual lawsuits have been utilized to try to bring accountability to Walmart’s treatment of its workers. Complaints filed by warehouse workers with the Occupational Safety and Health Administration (OSHA) and the National Labor Relations Board (NLRB) have alleged mistreatment and spurred on investigations from federal authorities. But Walmart has dragged its feet. More than anything, the strikes have unveiled the expansive warehouse industry that most Americans know little about and corporate abuses from the nation’s largest private employer. From the questionable hierarchy of subcontractors that Walmart — and other corporate retailers — employs to skirt labor laws to the difficult work environment and low wages, workers suffer, the lives of Walmart workers have gone largely unnoticed. The campaign for the striking Walmart workers has drawn incredible community support, highlighting the importance of worker centers. Organizations like WWJ, WWU, and OUR Walmart are crucial in the struggle for worker justice where unions are absent. Many worker centers are fiscally sponsored by unions and serve as focal points in broad-based movement building with non-labor allies. The worker center may represent a new face of labor activism in the U.S., but not without some controversy from traditional labor — as In These Times has opined. But the fact remains that without worker centers, Walmart workers would have little support within the labor movement and virtually no avenue to find solidarity among the broader populace, including clergy, community activists and organizers, and other local leaders. Worker centers are, at their core, grassroots organizing efforts to build leadership among workers so that they are equipped with the knowledge, resources and support they need to take action. The struggle against Walmart could not happen without them. As the campaign for Walmart’s workers — led by the associate members of OUR Walmart and Illinois and California warehouse workers — looks toward Black Friday, the busiest day of the year for retailers, the pressure is now on Walmart executives to listen to its workers and end the abuse. Nice article, it is amazing how much inventory that can be held in some warehouses. Thanks for posting.